Garfield and Hwy 99, near the new Rogue Federal Credit Union and the new Super Walmart. You can see the new Harry and David building to the right in green. New New NEW! I Just Got Featured on the Etsy Blog! Get the Look is a regular feature on Etsy that I always enjoy and I’m super stoked to have been included in today’s post! It’s a sweet loft on Airbnb in Detroit (somewhere I dream of going to do landscape painting, maybe I could stay at this place…) Check out the full post here. Last Friday I woke up to a glorious sunny day – the first in months! We always get a February false spring – or February Fake Out, as some call it. Warm weather for a few days before it starts to rain again. 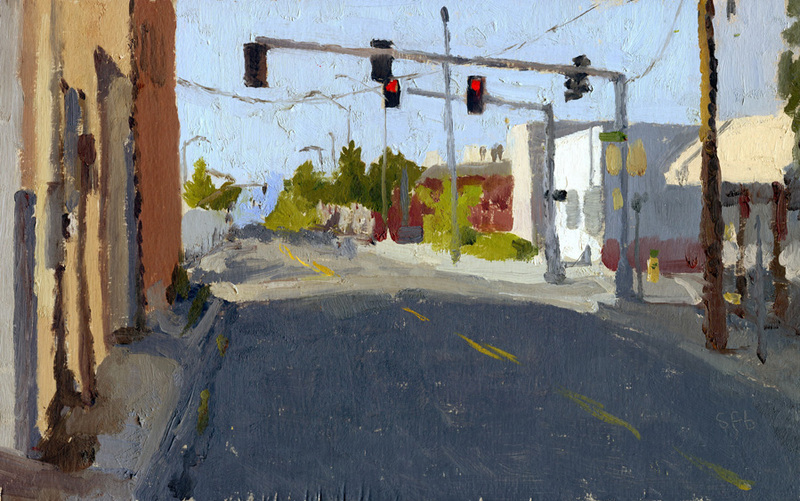 I gathered up my stuff and headed to a street in Medford that I’ve wanted to paint for a long time. Pear orchards have been a large part of the local economy here for years and this street – S. Fir St in Medford hosts both Naumes and Tree Top packing plants. Playing with and paying attention to the perspective on this one was super fun. It was fantastic to be out working en plein air after many months stuck in the studio. Of course I have grand plans again this year to spend much, much more time painting outside. We shall see!